Why Do Horses Have Whiskers? 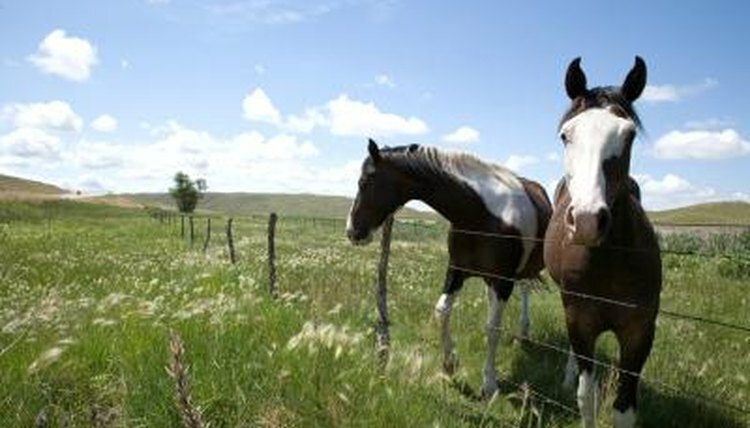 Whether male or female, horses have whiskers. Some competitors and judges may consider them to be unsightly in the show ring, but consider all facets of his life and living environment before you decide to clip them. You may decide to weigh the clipping decision in favor of his overall welfare versus the opinion of a trainer or judge. Consider the whiskers on your horse help with one of his key senses -- that of touch. Only in this case, his entire muzzle, including the whiskers, represent one of his most sensitive areas. In this regard, they help him not only to explore and to identify objects, but also to protect his sensitive nose and lips from touching something once he gets feedback from his whiskers. If you have ever noticed how your horse can pick minute grains from a bed of shavings or pile of dirt, you should appreciate how his muzzle whiskers help him with this precise effort. The whiskers guide him toward desirable food, and away from undesirable things that surround it. They work in tandem with his lips -- also very sensitive -- in pushing away anything he should not eat so that he can more easily pick up the edible items. If you see a horse with a nasty cut on his lip, look to see if he has had his whiskers clipped. Accidents can happen, and whiskers may not prevent another horse from biting him, for example, but whiskers give him an advantage when he is confronted with something that can hurt him by detecting it before he gets any closer. He may find a tempting patch of grass nestled smack dab in the middle of prickly pear cactus; without his whiskers, he could injure his lips, the inside of his mouth and even his eyes. Horses can lose their vision in one eye or both through genetics, illness, injury or simply with old age. It takes a while for them to adjust, and just like humans, they rely on their other senses to compensate. Their whiskers are vital to their compensatory efforts. Your vision-impaired horse will rely on his whiskers to map the landscape, giving him details about his surroundings and guiding him to familiarity and safety. Practical Horseman: Clipping Horse Whiskers: Yes or No?